It was like watching a train wreck. I wanted to look away but couldn't take my eyes off them. Her best friend and her mom's boyfriend. Locking lips. This is the secret Jasmine Evans has to keep at all costs. Because her mom is pregnant, and Jaz doesn't want to ruin her life-again (just being born did it the first time). But the harder Jaz tries to pretend everything is okay, the faster her life spins out of control. Until Jackson. He doesn't care about the popularity of her friends or the color of her skin. But can she really trust a guy who just transferred in from reform school? She might be willing to chance the heartbreak, but telling him everything and risking the truth getting out is a whole other level of scary. I had a hard time reviewing this book, which is why it's taken me so long to put up. I wanted to love it but ended up liking it overall and disliking it in part ... make sense? Yeah I know, see my dilemma. 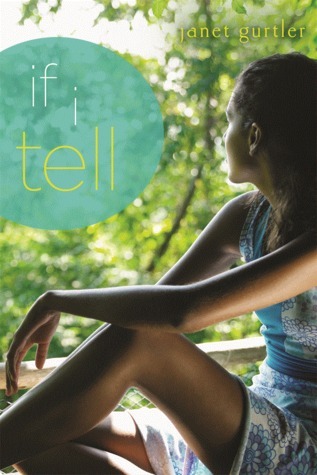 If I Tell is a quick read dealing with real issues; bi-racial relationships, atypical family units, betrayal, drinking, promiscuity, isolation, prejudice, post-natal depression, sexual identity, secrets and consequences. It's also a little book with a lot going on and I think that was part of my problem. There are few of us these days without "issues" but If I Tell seemed gratuitously overloaded with them or maybe it was just a case of squeezing too much into too little space. The main character Jaz is self-centred, isolated, bitter and conflicted and why shouldn't she be? She's bi-racial (think Oreo - Jaz does) in a small-minded town, she's been brought up by her Grandparents, her relationship with her mother is unusual and she's just seen her mother's boyfriend Simon, pashing her best friend Lacey. No wonder Jaz has trust issues. Want to know more about Janet Gurtler? - Check out her website or blog. Sounds like this is a good book to read. I heard mixed feelings about this book. I guess I will give it a try! Great review. Thank you for sharing! Thank you for stopping by and commenting on my blog! I absolutely understand where you're coming from. I think the author should've focused on a few problems instead of throwing so much into the mix!! I think (sad that I can't say for sure) that I have this one on my Kindle. I'll read it within a year...LOL!! I was at LindyLou Mac's blog and noticed your comment on her last post so I meandered over to introduce myself but got a bit carried away here and have been here for ages thoroughly enjoying all these posts. I have signed up to follow your blog now so I can keep up to date with these great books. Ah yes, one of the reasons I dropped by was to give you the link to LindyLou's review of my book. 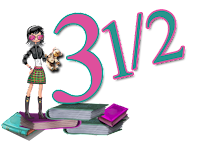 Hi Carol, welcome to my blog, thanks for the link-up I had a giggle when I went across to Lindy's blog, I'd already commented on the review and added your book to my wishlist. I was a little confused, thinking that Facing Fifty With Humour and Mini Skirts & Laughter Lines were 2 different books. Great review! The main character doesn't sound like someone I'd like but I will give this book a try anyway since I requested it from NetGalley.